1. 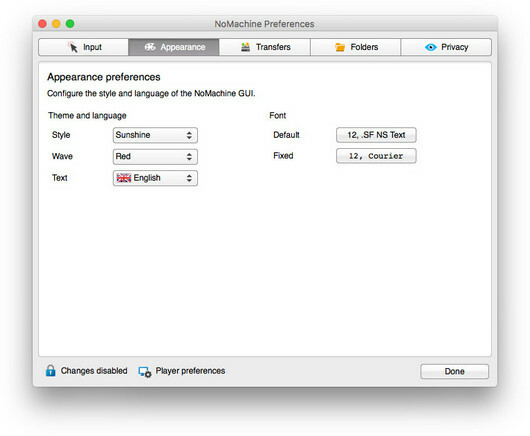 What is the NoMachine GUI? 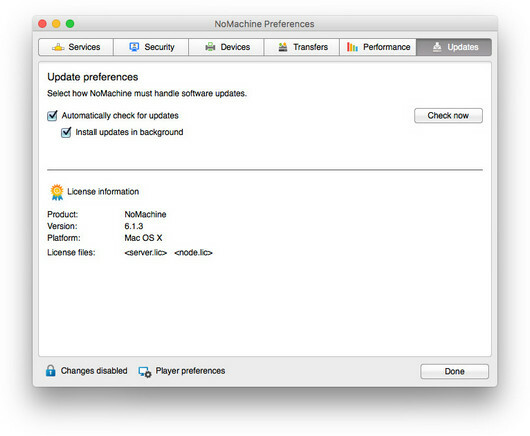 This guide is an introduction to the NoMachine GUI, present in NoMachine software version 4 or higher. It is intended to illustrate the settings that can be configured in order to tune access from and to the remote computer on which it is installed. There are essentially two user interfaces. I The Player Interface ("client side"). 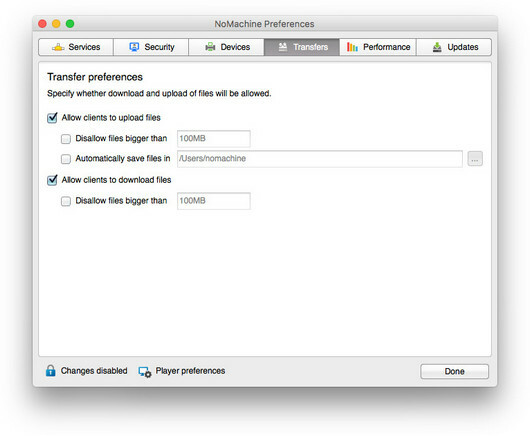 This is available when installing any of the NoMachine packages including Enterprise Client. II The Server Interface ("server side") which manages the services of the remote host. This is available when installing any of the NoMachine packages (free version and 'Server' products), but not the Enterprise Client. III organize Player log files and local privacy configuration. The Player GUI is accessible either from the system's Programs/Applications menu, or via any connection shortcut that you have on your desktop. By opening up the GUI, select 'Settings'. This panel lets you fine-tune keyboard input, mouse and pointer activity, as well as menu appearance to your own requirements. Check to 'Show the mouse cursor' of the remote computer when connecting via a shadowing session, i.e., if you are sharing the desktop session of another user and both of you are connected, the connecting user will see the owner's cursor as well as their own. Disabled by default. Users can enable 'Emulate middle mouse button' to use left + right click in place of middle-button on mouse during the remote session. Users connecting from Mac can enable 'Emulate right mouse button' to use Ctrl + mouse click in place of right-button on mouse during the remote session. Enable to send local key presses to the remote window, such as Alt-Tab and PrintScreen. Sending Alt-Tab key events will switch between different remote windows rather than switching among the local windows open locally. 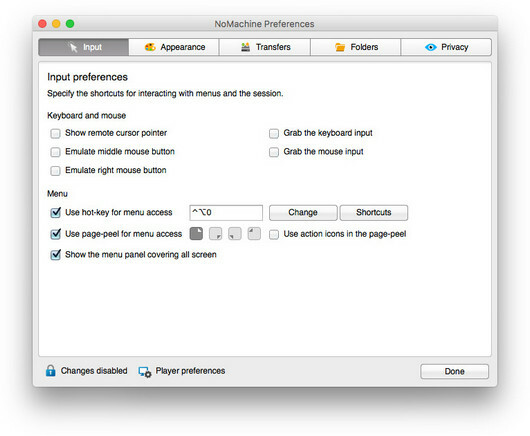 Enable to keep the pointer/mouse always within the NoMachine remote window. Check to 'use hot-key menu access and personalize the keys to be used by setting shortcut preferences in 'Change shortcuts'. Set to Ctrl-Atl-0 (zero) by default. 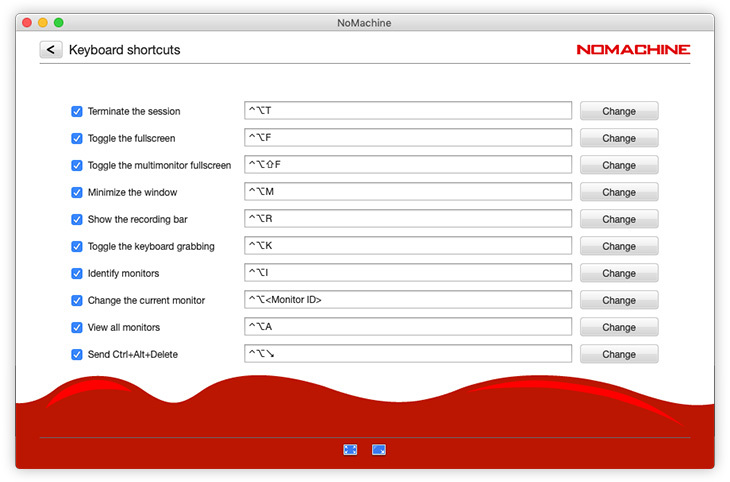 Set the shortcuts to be used within the NoMachine session that will allow you to terminate the session, toggle the fullscreen, minimize, show the recording bar, and others. Disable or enable 'Page-peel' and choose a corner that won't interfere with your browser or file commands (top right, bottom right, bottom left, or top left). Hovering over the corner to display a page curl effect will quickly pull up the Menu when clicked. Show icons 'Minimize', 'Fit-to-window' and 'Fullscreen' in the page-peel space. Choose how the menu should appear: covering all available window space or as an overlay. For a native look and feel, select Sunshine. 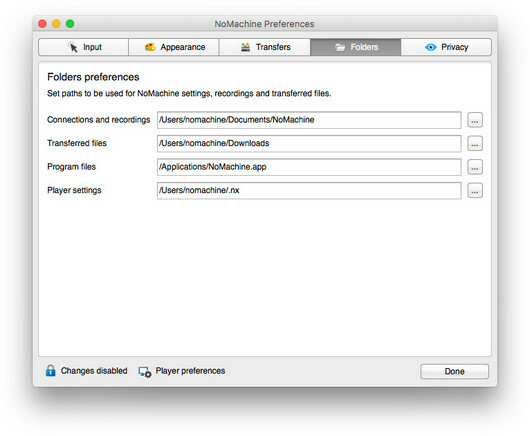 The NoMachine GUI will then integrate as a native app on your operating system. For a black GUI, select 'Moonlight'. Select the preferred language to be used in the GUI and dialogs. Note: some dialogs such as eventual error messages may be shown in the language of the Operating System. Select the preferred font. 'Fixed' refers to the font used by the Player should it have to show log excerpts. Default refers to the character style adopted within the GUI. This is where you set whether other users are allowed to send you files from a remote computer, plus any limits on size of the files that you can receive. 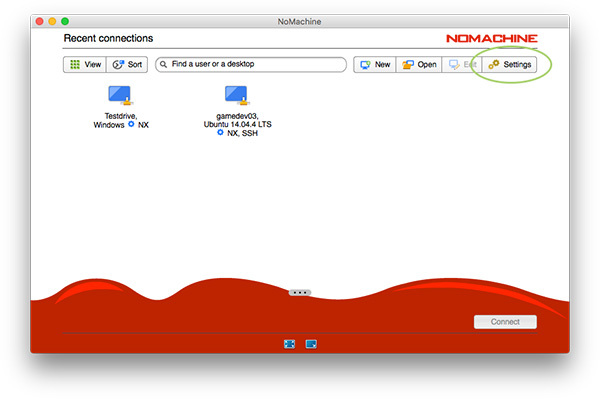 Configure the paths for NoMachine program files and connection settings. 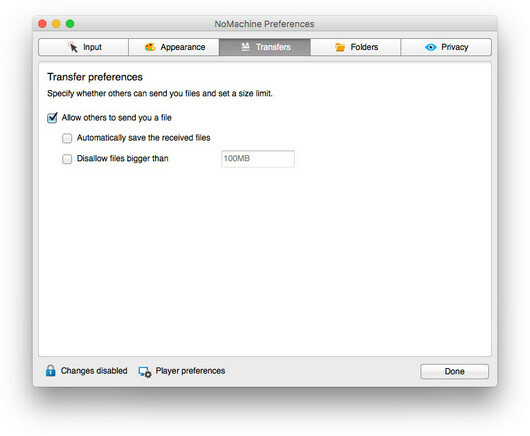 Indicate where you would like NoMachine to store transferred files and recordings. 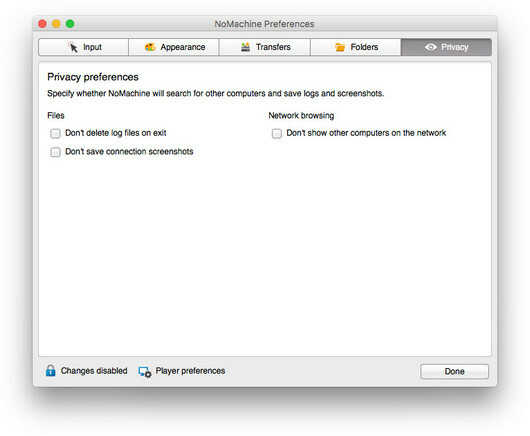 Configure whether NoMachine should store log files, screenshots and whether other users (on LAN) should be shown in the connection GUI upon opening. By default, network browsing box is not checked. Don't delete log files on exit - Select this to keep log files when closing the session. 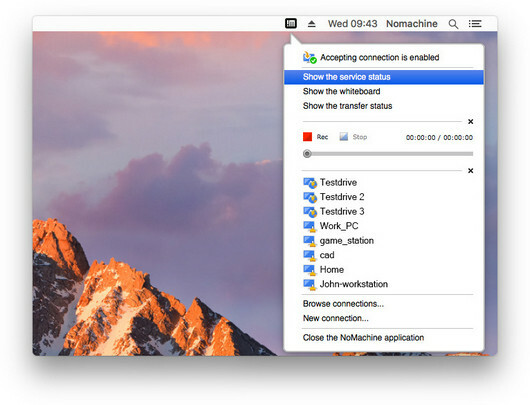 Don't save connection screenshots - When disconnecting, NoMachine will save an image of your remote desktop and show it in the connection dialog when you next connect. Check the box to not show a screenshot of the session. 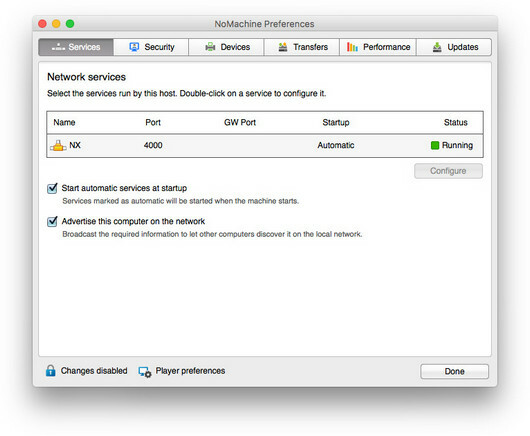 Don't show other computers on the network - Select this option to not see other computers connected on the LAN which have NoMachine installed. 'Server preferences' is where you go to configure the settings governing how the computer will be accessed from remote. Remember that this interface is only available when installing any of the NoMachine 'server' software packages. It is not available if you have installed Enterprise Client. Once installed and running on the computer you want to access, you can reach the 'Server preferences' via the "!M" icon in the system tray of your computer by clicking 'Show the service status'. Alternatively you can access the Server Preferences via the 'Server preferences' link, visible at the bottom of the panel in all the images above. If you have installed a 'server' product, the label 'Server preferences' will be visible instead. If checked (enabled by default), the services present in the list will automatically start at every computer boot. Enabled by default. Enable in order for the computer to show up in other users' connection lists when on LAN. 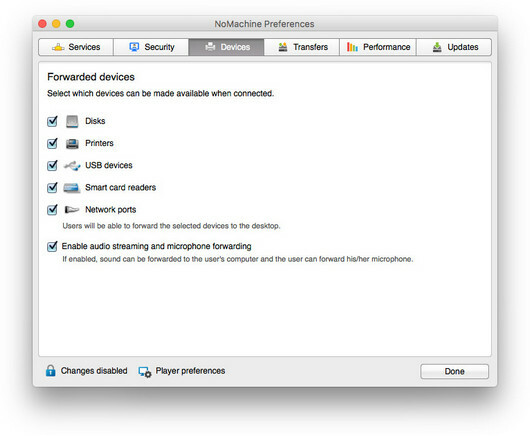 Other users will see this computer provided they have not checked the box 'Don't show other computers on the network' (fig. 7). Disabling will stop the broadcast of computer's availability on LAN. This area of 'Server preferences' allows you to set how you (and other users) can interact with your remote desktop. Enabled by default. If someone is trying to connect to your desktop, a pop up message asking for your permission appears. If the computer is unattended, this option should be turned off. Disabled by default. Checking the box means that users will connect in view only mode. Interaction can be enabled at a later time by the owner. Disabled by default. Checking the box stops the !M icon from being displayed. Notifications will still be shown. If a user connects or requests to connect to the desktop, or a user disconnects, a sound will be emitted. Check the box to enable screen blanking and block mouse and keyboard input. Useful for unattended remote computers to p event others from entering data or viewing the monitor while you are remotely accessing it. 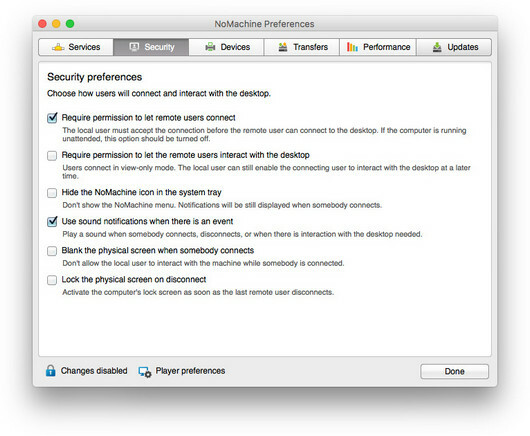 This option can be used in conjuction with the screen blanking: even when the last user didn't lock the screen before disconnecting by NoMachine, as soon as the screen is unblanked the system lock screen will be activated automatically to keep the remote desktop protected even if the computer is running unattended. Choose to allow specific devices (printers, scanners, disks and more) to be shared to the connecting client, including audio and microphone, useful when VOIP application is being used. Configure whether connecting clients are allowed to upload and download files from the computer, set any size limitations and specify the location where files must be saved. Connecting client must have the 'Allow users to send you a file' box checked (see fig. 5). 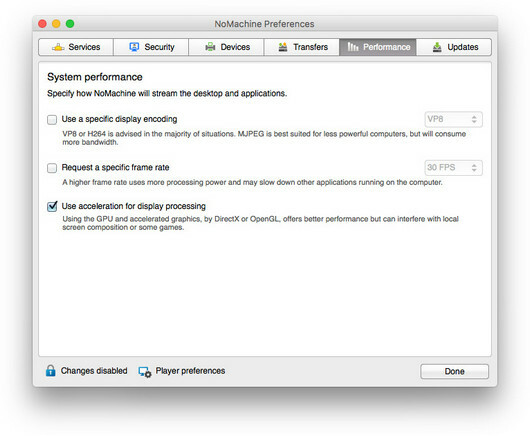 In the majority of cases, it won't be necessary to interfere with these settings since NoMachine will carry out the necessary checks and optimizations to give the best possible performance. The encoding method depends also on the decoding capabilities of the client. If the client supports H.264 decoding (by means of the hardware or by codec libraries), then H.264 will be chosen, otherwise VP8 encoding is always used. MJPEG won't be used unless it is explicitly requested. Configure a specific type of encoding (server side), choosing from H.264, VP8 and MJPEG. There are some cases where MJPEG might be more suitable such as when accessing a less powerful computer (legacy PC or computer with reduced CPU and RAM specifications). Selecting MJPEG will consume more bandwidth. Select the frames-per-second that you prefer. Higher is recommended for activity such as game-playing. Applicable to Windows only with support for DirectX (OpenGL on Mac and Linux coming soon). If enabled the remote Windows server/host being accessed will capture the screen content using DirectX. Here you will find information about the product installed and the license validity (if applicable). Additionally, enable automatic software updates. Leave unchecked if you prefer to do it manually. Updates are set by default to check NoMachine respositories every 2 days. You can override this by clicking 'Check now'.